I love empty sets. They would take these stills for continuity reasons, but, like security camera footage, they always have an atmospheric quality. A little bleak, a little scary. You may notice that the film is called DESTINY and the director is Siodmak (Robert). And you may know that no such film exists. What they were shooting was released as SON OF DRACULA, though in fact the main character is Dracula, not his son. He has no son. It’s fun to imagine that Dracula might be as invisible to photography as he is to mirrors and shadows. So Universal, trying to record his exploits on celluloid, ended up with footage of a lot of empty rooms. They had to get John P. Fulton to put Drac in afterwards. Or maybe it was just that Lon Chaney Jr. was off getting drunk somewheres. My first thought on the trivial mystery of the non-existent movie DESTINY was, Of course! Screenwriter Curt Siodmak, the idiot brother, wanted a classier title and thought he might persuade Universal that DESTINY would be boffo box-office. What a maroon! But I have a new-found respect for Curt after reading Donovan’s Brain. So I was pleased to find another explanation, or perhaps a deepening of the mystery. This set photo is from HOUSE OF DRACULA, a much later entry in the Universal monster series (the last, in fact, not counting ABBOT & COSTELLO). I like how the bat-signal is apparently considered part of the set. But look! This movie is also called DESTINY, according to the slate. 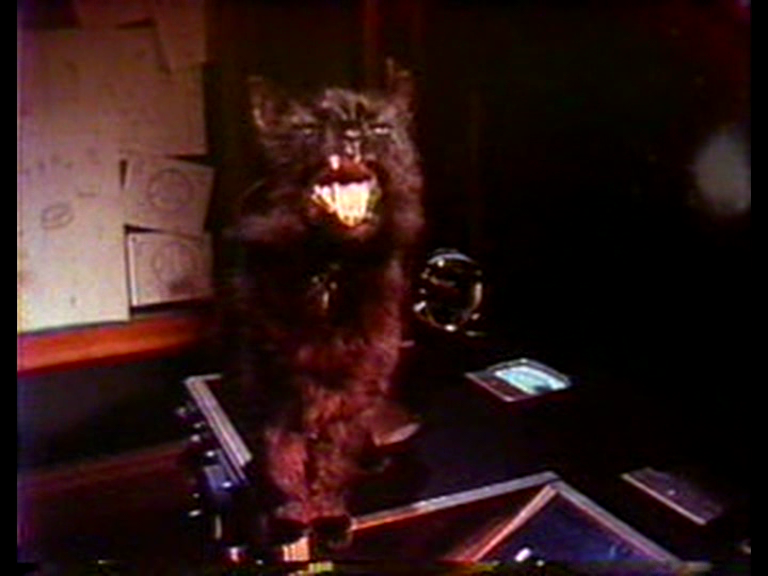 Though it would be amusing to imagine Curt S. still gamely trying to get an evocative, poetic title accepted by the front office years later, he had nothing to do with this film, apart from having created Lawrence Talbot, the wolf man. So it seems like Universal always shot their horror sequels under this false title, maybe to control the publicity until they were ready for it, or something? I know there are a lot of people who know WAY more about this stuff than me, so maybe they can help solve the puzzle. I have a lot more of these, if you like them. (1) The 1970s were cool (THE GODFATHER and PULP can be seen advertised in the background of a couple of shots, but they can’t compete with the awful guff going on in the foreground). (2) The presence of Dennis Price in a vampire film is always a good sign (VAMPYROS LESBOS). (3) Ringo Starr is a fundamentally well-meaning man who wants me to have a good time (HELP!, CANDY). (6) T Rex had alchemical powers which transmuted everything they touched into gold. (7) Jenny Runacre can make anything cool (THE FINAL PROGRAMME). (8) Dracula films with motorbikes are cool (THE SATANIC RITES OF DRACULA). (9) Freddie Jones is the kind of guy you can depend on to learn his lines. (10) Shakira Caine was only ever in THE MAN WHO WOULD BE KING and never made any films where she turned into a housecat. All of these self-evident truths, previously held to be inviolate, are thrown into question by this shambling travesty — how shall I go on in a world where NOTHING is certain? 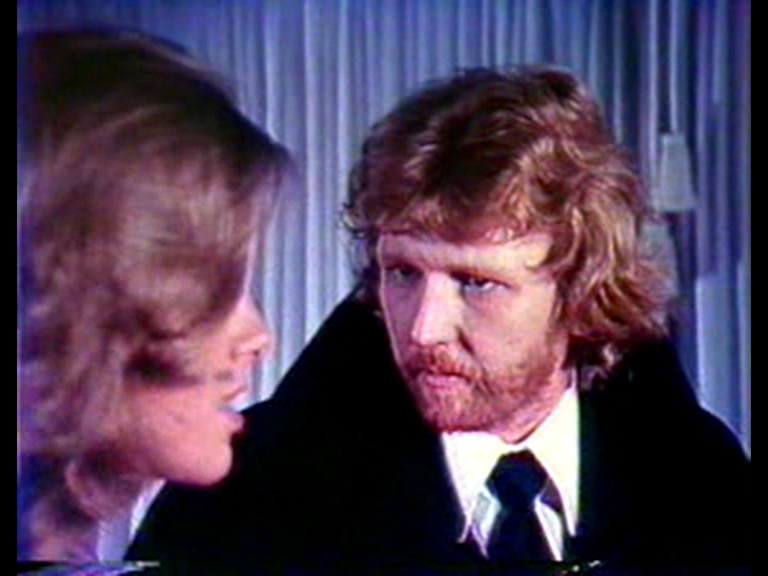 Harry Nilsson is a new kind of Dracula — quiet, authoritative, ginger. He plays the whole thing straight, which might have worked if everybody had gone along with it. After all, the script, by actress Jennifer Jayne working under a pseudonym (wisely), doesn’t actually provide any gags — apart from Dracula Jnr being called Count Down, for no reason. 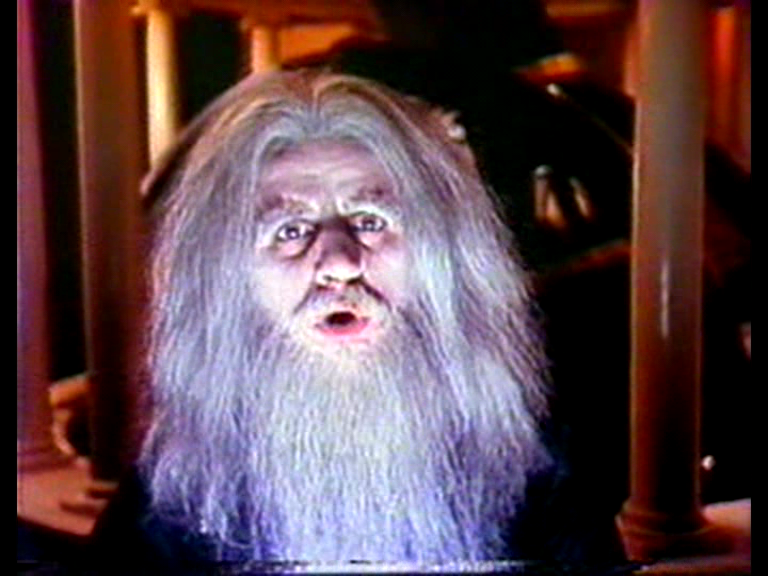 Ringo, as Merlin (what’s Merlin doing in this??? ), is Ringo. The rest of the rock stars just play music, which is a bit of a waste. The way to redeem this farrago would have been to play it absolutely straight, cutting all the “comedy” which would have taken about three minutes of script revision, and casting inappropriate musicians in all roles. THEN it might have been funny. Freddie Jones as Baron Frankenstein tries, apart from the aforementioned difficulty with the lines (which are often unspeakable sci-fi gibberish, to be fair), but think what Keith Moon could have done! Seized the role by the throat and worried it to death, I should think. And Dennis Price as Van Helsing? Sure, he seems to have sobered up for the day’s work, and Francis shoots him as if he was actually there, in the scene with the other players, which must have been a bewildering change for Price, who was usually filmed to look as much like stock footage as possible (see HORROR HOSPITAL if you don’t believe me), but this has the effect of depriving Peter Frampton of the opportunity to wear a goatee and operate lab equipment. It’s a terrible injustice. Extra points for recognizing the space footage swiped from A MATTER OF LIFE AND DEATH. 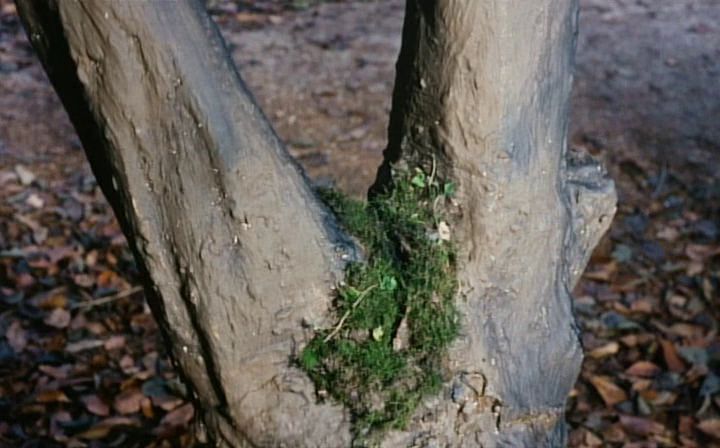 At least Freddie Francis worked on AMOLAD. Did David Niven feel raped? Probably not — he was too busy making VAMPIRA. 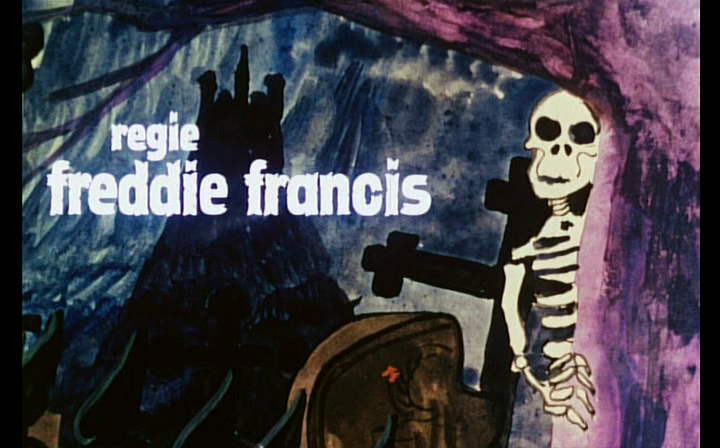 Francis apparently had a horrible time on this film — not the world’s greatest director (but one of the greatest cinematographers, as THE INNOCENTS and THE ELEPHANT MAN testify), he found himself employed on a rock folly tax dodge, where the professionalism which was his main attribute as director was not respected or required. He says it led him to give up directing, although one notes that he had not hit bottom yet — he made CRAZE the same year, with Satanist Jack Palance trolling for sacrificial victims in the Raymond Revuebar. The following year’s THE GHOUL and LEGEND OF THE WEREWOLF are shoddy, but mark a slight step up. The Revuebar is glimpsed here too, in a Swinging London travelogue which actually contains the film’s only moments of visual felicity — a girl walks past and a neon light flicks on offscreen just as she catches the vampire’s eye, causing her to flare red — and the Coke sign’s red wave lights up from top to bottom EXACTLY like a pool of blood flowing downhill. One odd thing among many — SON OF DRACULA is actually set in the future. An opening title gives the date of Dracula’s staking as “the 1880s” — which is strangely vague, as if the writer is unsure of her facts — and Count Down’s coronation, which takes up most of the plot, is set “a hundred years later” — also, he gets from Transylvania to London via the Channel Tunnel, which did not yet exist in 1974 (it’s represented by an underground car park — this is, after all, a film which boasts of being made “entirely on location”). Yet despite all this, Piccadilly Circus still boasts ads for THE GODFATHER. 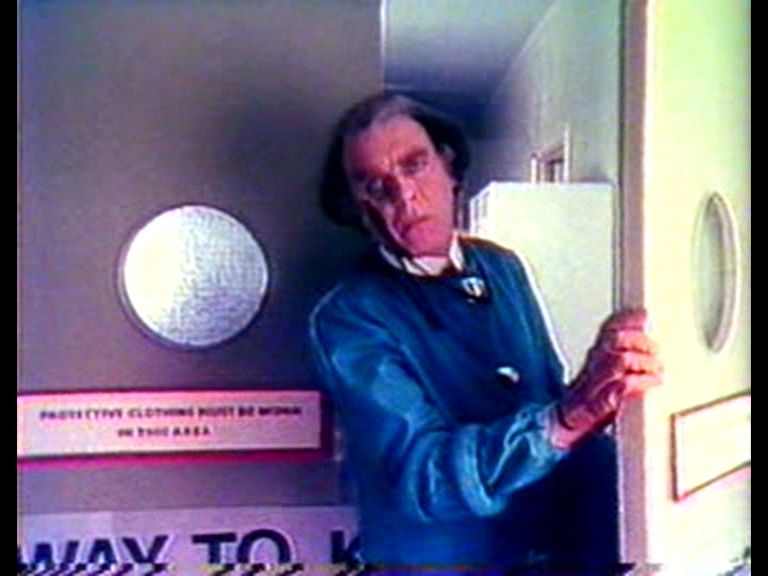 Francis would show this blithe disregard for setting again in THE DOCTOR AND THE DEVILS, Dylan Thomas’ Burke and Hare script, belatedly filmed in 1985. Relocating the story to London would have been a perfectly reasonable action, since the characters are all re-named anyway, but Francis inexplicably keeps the Edinburgh locale (with a single location shot of Arthur’s Seat) but has everybody talk in cockney accents. I can understand him not wanting to give himself a migraine by reading the SON OF DRACULA script too closely, but when Dylan Thomas is involved, I think a little more care would be welcome. I am indebted to Shadowplay informant Danny Carr for reminding me that S.O.D. (“an Apple Production”) existed, thus prompting me to obtain a copy. Remind me to stab him in the forehead next time I see him.